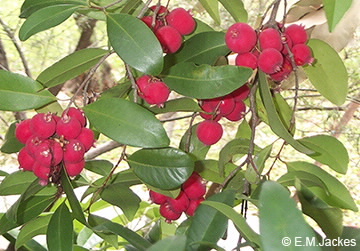 The native tree grows to about 4 m tall. Leaves are opposite 6-11 cm long and 3-5 cm wide, the lateral veins are not very obvious; oil dots are numerous. 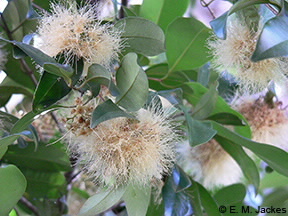 Flowers arise in clusters, stamens numerous, cream to 25 mm long. Fruit fleshy, dark pink to red globular to globular-depressed to 1.6 x 2.1 cm, calyx lobes 4 and persistent on fruit.